There are many issues surrounding Bafana Bafana currently but a nagging consistent question for all too long now is – Where is South Arica’s goal scoring striker? The number 9, the go-to-man, the predator in the box! Current coach Shakes Mashaba has utilised the likes of Tekolo Rantie, Sibusiso Vilakazi, Bongani Ndulula and Lehlohonolo Majoro all without any serious success. Rantie, at the age of 24, is perhaps the most talented of the bunch and may still have a bright future with the National Team but currently is a far cry off from the South African strikers of yesteryear. A mention of those strikers from yesteryear and one in particular stands out. He was undoubtedly the best striker South Africa has produced in its short, post-Apartheid history and also arguably the last one of any serious quality. It seems so long ago now that a young, energetic, talented kid, born on the dangerous streets of Hanover Park on the Cape Flats, lit up the 1998 African Nations Cup. Benedict McCarthy, better known as Benni, was South Africa’s hero. At the tender age of 20 he finished joint top scorer at the 1998 AFCON with 7 goals in Bafana’s 6 games and was named Player of the Tournament. From humble beginnings, Benni’s rise to fame is deeply embedded in the history of South African football. For since the 6th June 2013, when McCarthy announced his retirement after a glittering 17 year career, the question still remains; Will South Africa ever unearth another Benni McCarthy? The answer to that question in all likelihood is no. However, South Africa desperately needs another reliable striker, which they have been deprived of for so long. The reason why South Africa will never find another Benni, is because he was more than a goal scorer for Bafana Bafana. Upon reflection it’s important we understand the impact players like Benni and Quinton Fortune had not only on South African football but on South African society in general. Players like Benni allowed young South Africans of all colours and races to dream big. They proved that despite having odds stacked against you, if you possess talent with the correct work ethic, there are no boundaries to what you can achieve. From the dusty, dirty and dangerous streets of Hanover Park to the impeccable Arena AufSchalke in Germany, where he lifted the Champions League Trophy in 2004. The path in-between was not simple and straightforward and nor did it end there. McCarthy came at a time when South Africa needed to rebuild after the success of the 1996 team. A few members of that unforgettable squad had aged and Bafana Bafana was crying for an injection of new youthful talent. Benni simply captivated a nation. South Africa finished runners up at the 1998 Afcon and in the build up to the 1998 World Cup he was the one name on everyone’s lips. 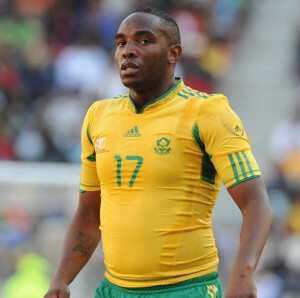 Benni struggled with weight issues later in his career. McCarthy’s list of achievements and records speaks for itself. He possesses a CV that any footballer can gladly hold in high honour. However, as the case with many footballers, the former Blackburn Rovers striker, does not herald free of a little controversy. A disappointing spell at West Ham in the latter part of his career saw him suffer with weight problems. West Ham vice-chairman Karren Brady described him as a “big fat mistake” after he left the club. His all too familiar battles with SAFA and the South African National Team also somewhat blighted an otherwise excellent career. In Benni’s defence, world class footballers enduring various struggles through their careers is by no means uncommon. So while yes McCarthy had his struggles, we should be careful not to underestimate the lasting impact he has had on South African football. With 32 goals in 80 internationals, Benni is South Africa’s all-time top goal scorer. Records are meant to be broken but unfortunately for Bafana Bafana this one is unlikely to be even threatened for some time to come. Bafana’s current failure to find or establish a recognised goal scorer is embodied in the local Premier Soccer League. In the past two seasons Bernard Parker has finished top goal scorer with a mere 12 and 10 league goals respectively in a 30 game season. A lethal, regular, goal scoring striker has become a rate commodity in the PSL nowadays. Mashaba and Bafana Bafana have much to work on but a top priority is surely the quest to find a young striker who, above talent and technique, displays the passion and hunger for goals Benni displayed once upon a time.